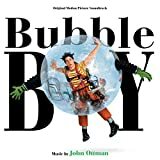 Accueil Produits Bande originale La bande originale de “Bubble boy”. La bande originale de “Bubble boy”. Sortie : 11 septembre 2001. Birth of Bubble Boy – 3:04. End of the Ride – 0:33. Girl Next Door – 1:30. The Clouds / Riding With Push Pop – 2:08. Dumped / The Chosen One – 1:04. Jimmy Escapes (Rocky) – 1:26. A Father’s Love – 2:09. Cows and Ice Cream – 1:49. Phreaks To the Rescue – 1:39.